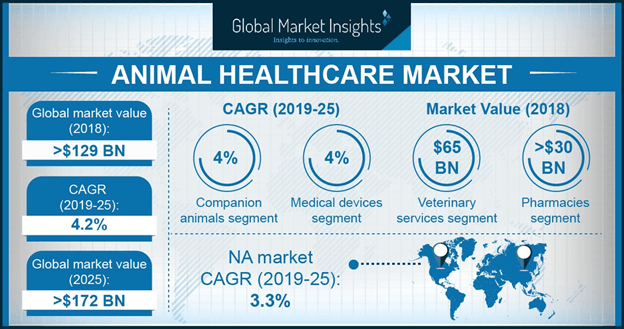 Animal Healthcare Market valued above USD 27 billion in 2017 and is projected to grow with a CAGR of nearly 4% during the forecast period. Rapidly increasing pet adoption need to control spreading of zoonotic diseases, favorable government initiatives to promote animal healthcare practices, constantly growing demand for animal source protein and advancements in animal drugs development are some of the driving forces behind global animal healthcare market growth. Adoption of diverse types of pets, especially dogs and cats are a trend observed worldwide. Growing disposable incomes in emerging economies is enabling people to adopt pet animals and spend on their healthcare; for instance, number of pet animal in India rose from 7 million to 10 million from 2006 to 2014. The trend is most likely to continue in coming 5-7 years, resulting to continuous demand for various pet animal healthcare products and contribute to total animal healthcare industry size. Increasing incidences of zoonotic diseases in human due to consumption of food animals also happens to be a major factor for market growth. As prevention measure, number of biologicals have been developed to address the problem. Governments across the globe have initiated animal vaccination programs and made vaccination a mandate. In coming years, with development of new biologicals and drugs, the animal healthcare market size should witness significant growth. Growing demand for animal source protein should result to more animal farming in coming years, thus give rise to demand for animal healthcare products. Furthermore, development of new drugs such as pet cancer drugs will augment growth during the forecast timeframe. Veterinary pharmaceuticals market is estimated to expand at 3.9% CAGR over the forecast period. Animal Anitiparacitisides and anti-infective drugs are major contributors to the animal pharmaceuticals market size, owing to increasing need to keep food animals’ disease-free. In past, as the veterinary diseases outbreaks had disrupted the industry at large, focus on use of pharmaceuticals has increased significantly and will continue in coming 5-7 years. Moreover, pet medicines have been in great demand lately. Pet owners around the world are willing to subject their pets to drugs more than ever; as a result, number of pet drugs have been developed in recent past and many are in pipeline. Animal vaccine market is estimated to expand at CAGR 3.9% during the forecast period. Vaccines have gained importance rapidly in past 2 decades. The objective of animal industry to focus more on prevention than cure has resulted to development of several vaccines and is broadening the pipeline. Trading of animals or their meat for consumption has been increasing vaccination practices worldwide. Moreover, government vaccination programs such as schedule vaccination program for dogs by The Veterinary Medicines Directorate UK are fueling the vaccine market growth. In coming years, developments in pet vaccines should spur the market growth significantly. Currently valuing over USD 4,600 million, the medicated feed additives market is poised to become a major contributor in years to come. Burgeoning use of medicated feeds is augmenting the market growth around the world. With objective to increase production of disease-free animals, the demand for medicated feed additives is surging at great pace; in fact, the market is projected to grow multifold during the forecast timeframe. Ban on antibiotics and antimicrobials mainly in the U.S. and European regions has been hindering the market growth. Countries such as UK, France, Germany have restricted the use of several antibiotics in animal feed; as a result, the antibiotics feed market is falling noticeably. Up-surging demand for animal protein due to increasing consumption of meat is a major factor for farm animal market growth. With objective to scale up production of healthy animals, the use of various animal healthcare products such as drugs, biologicals and medicated feed additives has been increasing at fast rate. Along with the ever-growing population, the demand for animal meat will certainly rise in years to come, resulting to growth in farm animal healthcare market. Pet animal healthcare market valued USD 1,900 million in 2017, is positioned to expand rapidly in coming years. Globally, the pet adoption rate is projecting high as people opt for animals for companionship. Moreover, as the disposable incomes of pet owners are growing, they are spending on pet healthcare more than ever. 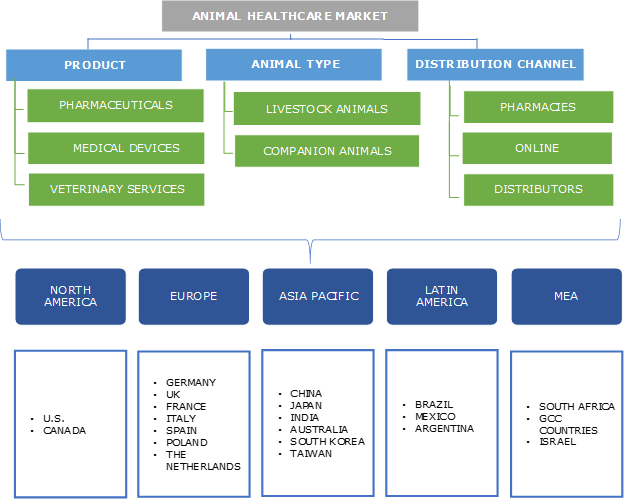 Europe animal healthcare market accounts for more than 25% of the global market. Research and development in European regions are a significant factor; companies in Europe spend nearly 10% of their turnover in R&D practices every year. UK animal healthcare market is amongst the top five and holds nearly 15% market share. Biologicals and anti-parasiticides accounts for more than 50% of total UK animal healthcare market. Restriction on use of antimicrobials should hit the UK market significantly during the forecast period. Extensive animal husbandry practices in India is one of the prime factor responsible for growth in Indian animal healthcare market. India is home for more than 10% of global livestock population and ranks among the largest producers of cattle, chicken and fish. Rising awareness about animal health is predominant factor for increasing demand of animal healthcare products. With objective to explore and exploit the promising opportunity, number of companies are entering the Indian market. China animal healthcare market is projected to grow with highest CAGR of over 10% during the forecast period. Since the upliftment of pet owning ban, adoption of various pets, especially dogs have been increasing rapidly across the nation, resulting to rising demand for animal healthcare products. Major enterprises operating in the industry include Zoetis, Merck, Elanco, Bayer, Boehringer Ingelheim, Virbac, Ceva Sante Animale, Phirbo Animal Health, Vetoquinol. Top 10 companies hold nearly 80% of market share and are most active on the global arena. Intense competition is seen among the top companies. Product differentiation, new product launches, geographic expansion and merger and acquisition are some of the strategies practiced gaining competitive advantage. The animal healthcare industry is a relatively new industry compared to human healthcare industry. In past 3 decades, it has evolved rapidly in terms of product development and coverage of broad categories of animals. The industry has been consistently dominated by established big human pharmaceuticals companies. However, new specialised animal healthcare companies have been shaping up lately.